Hello lovelies! Happy Friday :) Are you ready for the weekend? I know I sure am! 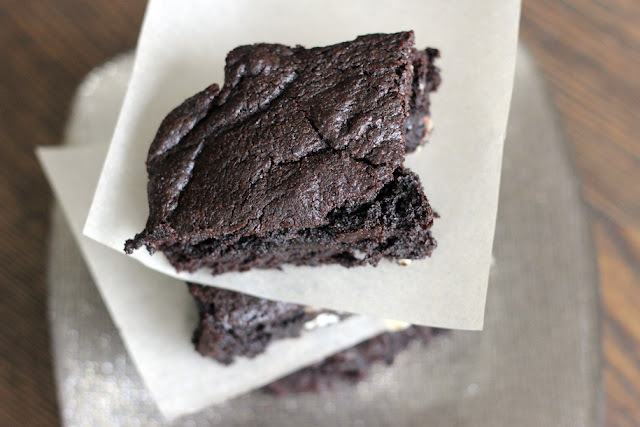 But first, I have a great brownie recipe for you here. My good friend Megan came to visit from Seattle not too long ago. Megan was my roommate back when we were both in school - her for culinary, me for design. Kinda crazy which one of us ended up with a food blog, isn't it?! 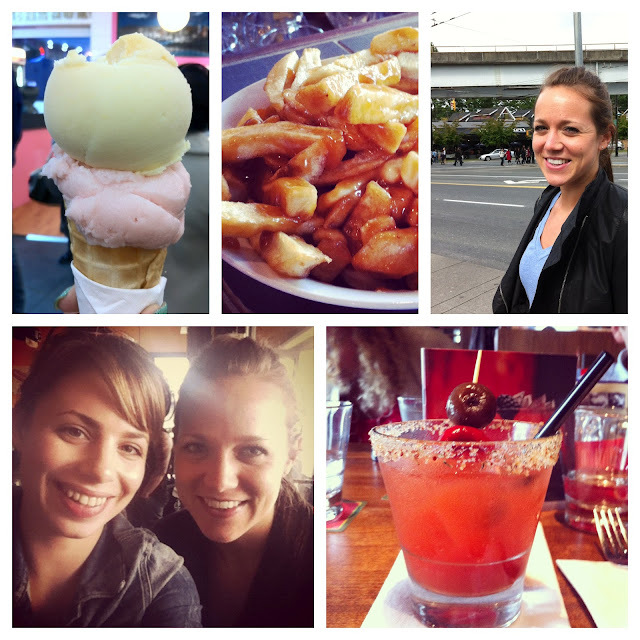 Needless to say, we are both huge food lovers and whenever we get together it's jam packed with culinary adventures. In two days we managed to scarf down a whole lotta deliciousness. This included (the BEST EVER) sushi at a little local place called Toshi. I could eat here everyday, its that good. The miso black cod is ridiculous (and I hear the eggplant is pretty good too... if you're into that kinda thing). Then there was this Gelato: Flavours settled on after sampling nearly every one of the 218(!!) on site were grapefruit-champagne and guava-papaya. Holy yuuuum. There was also... poutine, a crepe breakfast, chocolate truffles, spiked raspberry lemonades, many cups of tea, and of course, the brownies! I think Meg put it best when she said "If we lived any closer, we'd both be a lot fatter". 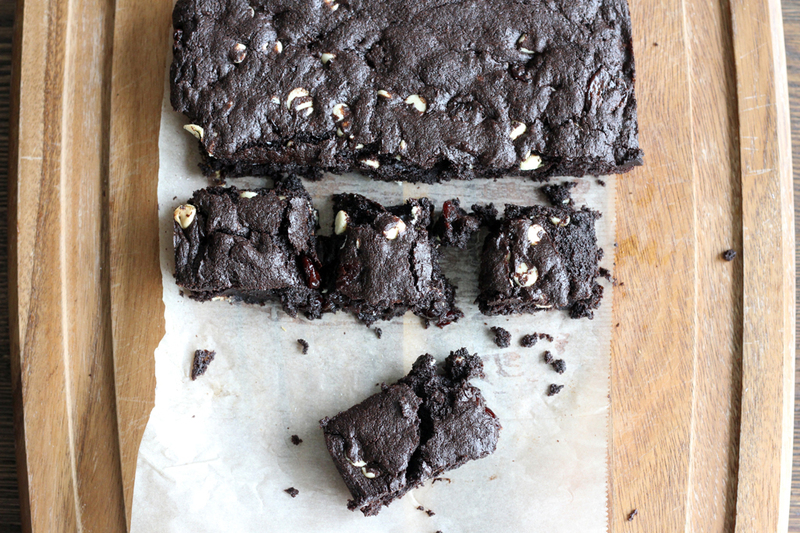 Back to the matter at hand, these brownies. They are dark, sweet, gooey and fudgey. And also gluten free! The gluten free-ness here is hardly noticeable, as there is so little flour in the recipe to begin with. But you can easily swap it out for regular flour if thats what you have. 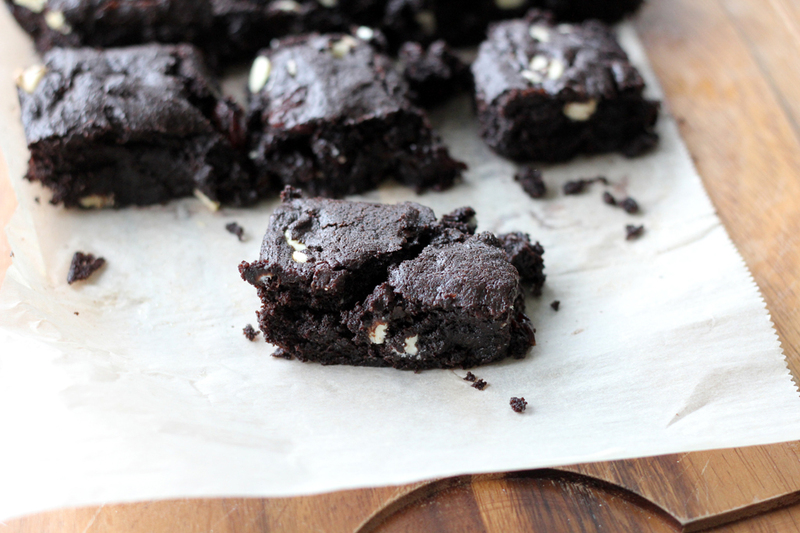 Make sure to use a reeeeally good dark chocolate for this recipe though. 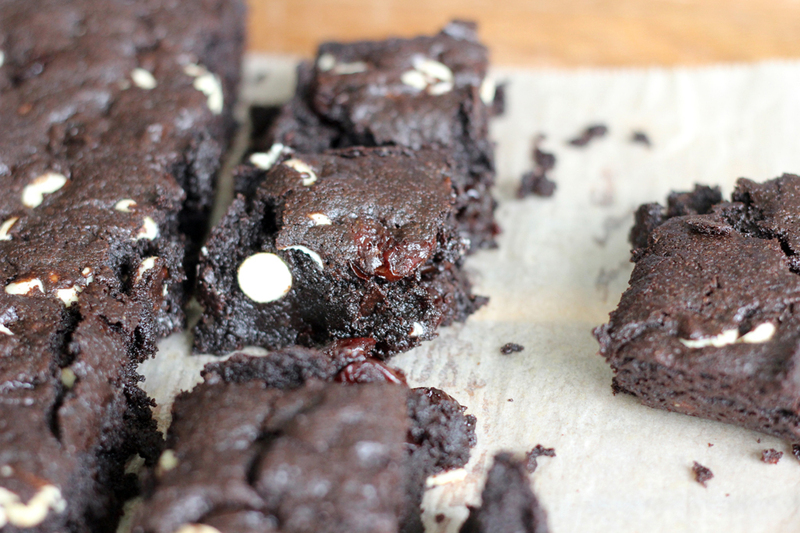 The sweet white chocolate and tart cherries are amazing with the ultra-chocolatey-not-too-sweet-brownie batter. LOVE. 1. Preheat oven to 350 F. Butter an 8X8 Inch baking dish and line it with parchment paper, so that the edges hang over 2 sides of the pan. 2. 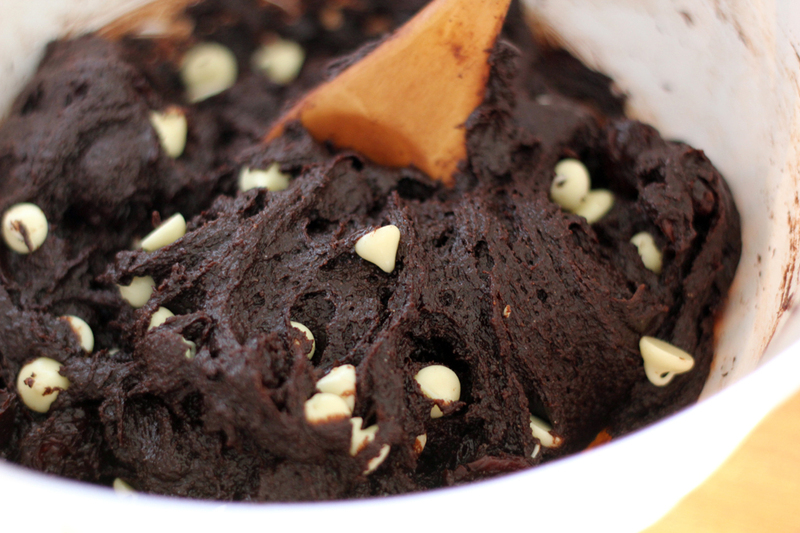 Melt the chocolate with the butter in a double boiler (or the microwave! ), set aside to cool. 3. In a separate bowl, whisk together the flours, xanthan gum, salt, and baking soda. 4. Add the sugar to the chocolate mixture and beat well. Add the eggs one at a time, whisking well after each addition, followed by the vanilla. Combine the dry ingredients into the chocolate mixture until just combined, try not to over mix. Fold in the chocolate chips and cherries. 5. Pour the batter into the prepared pan. Bake for 30-35 minutes, until the sides begin to firm up. The centre will still be quite soft, and may seem underdone. But be careful not to over bake them. 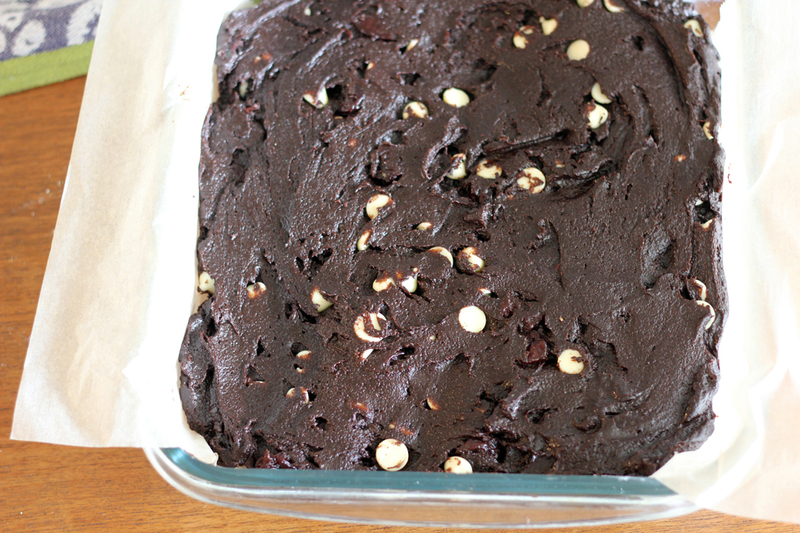 Let cool before slicing into squares… if you have the will power. Clearly, we did not. Love ya Meg! Can't wait for the next time we get to visit. We still need to get our glitter on! !